When thinking of what your pet cat’s daily needs, it is normal to assume just food, water and shelter. Unfortunately, this common misconception often leads to stress, particularly when it comes to indoor cats. 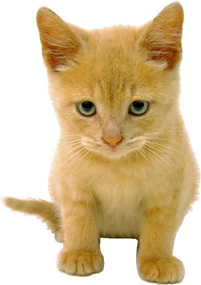 The problem is that generally, stress in cats can lead to severe stress-related disease as well as behaviour problems. Cat environmental needs are just as important as food and water in their overall well-being. It is essential to provide them with opportunities to express normal behaviour to reduce stress in their lives (in addition to reducing vet visits for you!). All cats require the same environmental enrichment, regardless of if they are showing signs of stress or behaviour problems as unnoticed stress will, in all likelihood, progress to problems requiring veterinary involvement (over grooming, feline lower urinary tract disease, upper respiratory infections etc.). Here are some ways to implement environmental enrichment for your feline companion in your own home. Puzzle feeders are a great way to mimic the natural hunting behaviour of working for a meal. This stimulates your cat to use their senses and wet or dry food can be used. There are many kinds of puzzle feeders available as well as tutorials online to make your own out of household supplies. Another benefit is that feeding with a puzzle feeder will take more time out of the cat’s day to eat. This reduces the amount of food consumed as well as reduces the amount of time to become bored and develop behaviour problems such as over grooming. Each cat should have their own feeding space plus an extra in case. Cat It Food Tree & Cat It Senses Digger (links to amazon.ca) – “Cat It” carries many other good environmental enrichment products for cats. Trixie Flip Board Level 2 & Trixie Move 2 Win Level 3 (links to amazon.ca) – Trixie has varied puzzles good for cats and dogs! Different levels to suit different abilities. Cats need their own space. They tend to be territorial especially when easily accessible resources are lacking. This includes space for feeding, water, litterboxes and scratching as well as vertical space and places to hide. Water bowls should always be kept away from food as contamination of the water with food particles tends to discourage cats from drinking. Water can also be used as enrichment by adding pet water fountains to drink from as well. In multi-cat households, each cat should be fed separately to reduce the occurrence of bullying. Cats should also have access to multiple water bowls spaced apart for this same reason. A general rule for litterboxes is to have a litterbox for each cat, plus an extra. These litterboxes should be spaced out, cleaned consistently and allow for the cat to exit from two directions. This can help to reduce the occurrence of cats not using the litterbox as there will be less conflict in accessing the boxes. Scratching posts are also an important part of a cat’s wellbeing. Normally, cats scratch to stretch (relieving tension, think of it as yoga for cats. ), scent mark and sharpen/wear down claws. If cats are scratching furniture, it indicates insufficient opportunity to display this necessary behaviour. Supply sturdy posts and mats with different materials to find out what your cat(s) prefer. Additionally, ensure your cat’s nails are regularly kept clipped to reduce the urge to scratch as often. Vertical space is a great way to add space to your cat’s territory. Indoor cats need this space especially as it is not comparable to that of a natural outdoor cat’s territory. In multi-cat/animal households, it also gives space to avoid conflict and get away. This is necessary to enable your cat to calm down after a stressful encounter. Also, cats often enjoy watching the room/out the window from a high place where they can feel secure – another way to alleviate boredom. Places to hide are essential to increase an anxious cat’s sense of security. Boxes with a hole cut out are a cheap, effective way to incorporate hiding places into your household. Tunnels and cat hideaways are also available from pet stores. Cat towers add places to scratch, vertical space and can have cubbies to hide in. These are highly recommended to enrich your cat’s environment. No matter how confident your cat may seem, places to hide are important. Not having sufficient places to hide can cause a lack of a sense of security thereby likely leading to reduced confidence, stress and eventually, possible stress-induced disease. 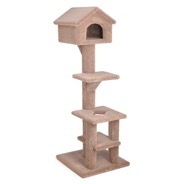 Cat Trees/towers are great for providing places to hide, vertical space as well as a scratching post. Although it may seem logical to get more cats to give your cat more stimulation, it is often detrimental to the cats’ wellbeing unless raised together from a young age. All cats are capable of living alone, some cats will accept social contact with another of their species but most will avoid it. If your cat is not bonded, it is far better not to have more than one cat. If you have more than one cat, even if bonded, ensure that the resources mentioned above are adequate. See “further information” section for signs of bonded cats. Interaction is important to reduce boredom and its associated problematic behaviours. Cats that are bored, have excess energy and not enough stimulation tend to use their energy and focus on unwanted behaviours (over grooming, destruction of furniture, etc.). They often become stressed. Cats naturally enjoy pouncing, it releases endorphins similarly to humans when exercising. This in turn makes them happier. It is recommended to engage in play with your cat with toys on sticks and toy mice for them to chase and pounce on. This mimics natural behaviour. Contrary to popular belief, cats can be trained. This is an ideal way to interact with your cat as well as stimulating them to think. Most cats are food driven so training should be done with treats. With calorie restricted cats, instead of feeding with a puzzle feeder, the cat can be fed their food as treats daily. Another way to enrich their lives is to play cat DVDs (sold online and in pet stores). These DVDs include sounds and sights that fascinate the cat for hours. However, this doesn’t entice all cats but it worth trying out with your own. Outdoor bird feeders by accessible windows are similar in effect and often work with all cats.